Everything went according to form in the Divisional Round (3-1, 5-3 overall) until the Jets decided to spoil the favorites party with a convincing win over the seemingly unbeatable New England Patriots. Elsewhere the Green Bay Packers breezed to a win over the #1 seed Atlanta Falcons, the Bears reminded everyone that the Seattle Seahawks were under .500 while the Steelers struggled early on only to surge back past the Baltimore Ravens. It's down to the final four, the Conference Championships. Flash back to Week 15 of the regular season. It's a snowy, cold December night and the New York Jets (11-5) are reeling, having lost two in a row including a 45-3 crushing by the New England Patriots. The Pittsburgh Steelers (12-4) were struggling with injuries to key players Heath Miller and defensive juggernaut Troy Polamalu. Despite the injuries and perfect play from Mark Sanchez and Jets special teams, it came down to a last second miss from the Pittsburgh offense. This time around things are different. The Jets have won three in a row, including an impressive victory over the New England Patriots. Not to mention a victory over Peyton Manning and his banged up Colts. On paper the Jets victories on the road to Pittsburgh are impressive. In reality the beat the 20th (Colts) and 25th (Patriots) ranked defenses that they faced. Combine that with the injuries that Colts and Patriots faced they were short handed. 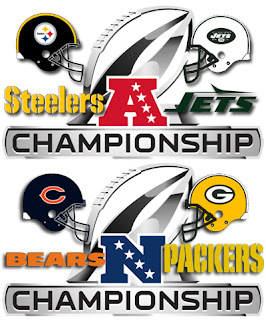 In the end the Steelers are the more experienced and healthier team than either that the Jets have played so far. That Week 15 meeting outcome came about because of far too much perfection for the Jets. Nearly perfect play by the Jets and Mark Sanchez, the lack of Troy Polamalu, and no Heath Miller for the Steelers. The special teams accounted for seven points and incredible punts pinned the Steelers deep just about every time. None of this is likely to be repeated. This time the Steelers come out on top on the way to their eighth Super Bowl. It's the Bears/Packers trilogy. They've met over 100 times in the regular season but for only the second time in this long time rivalry do they meet in the post season. Looking back to the regular season, it could have been seen that it would lead to this. 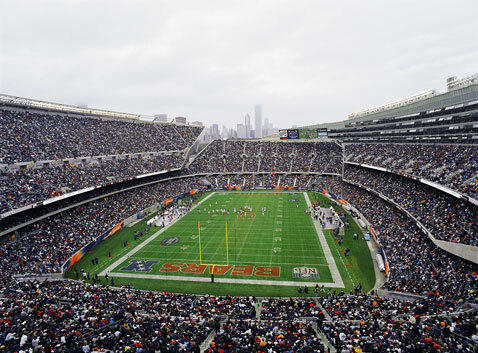 In Week 3, the Chicago Bears (11-5) beat the Green Bay Packers (10-6) 20-17 on a last second game winning field goal. Jay Cutler managed the game while neither running game could get anything going. In the end the penalties by the Packers pushed the Bears over the top. In the Week 17 rematch, the Packers had everything riding on it. With a win they entered the Playoffs. With a loss they sat at home. The Bears already had the North and a #2 seed locked up. They weren't playing for anything but pride. Despite this, the Bears defense held Aaron Rodgers to only 229 yards and Matt Forte carved up the 25th ranked Packers rush defense for 91 yards. In the end the Packers won 10-3, with the game being tied 3-3 at the half. It's perhaps the hardest game to pick in Championship weekend. Rodgers has been stellar all year except when playing the Bears. He struggles against the athletic Bears defense. His numbers look the same but he can't quite get over the hump. Even in a must have game in Week 17 he struggled, topping 10 points. He looked stellar last week against the Falcons but against the better, more athletic defense of the Eagles... not quite. It'll be a struggle for both sides but in the end the Bears defense and running game will keep it a closer game, something the Packers are 2-5 in. The Bears make it to their third Super Bowl. Barely. Pardon the pun.